Vincenzo Salvatore Carmelo Francesco Bellini (November 3, 1801 – September 23, 1835) was a Sicilian opera composer. Known for his flowing melodic lines, Bellini was the quintessential composer of Bel canto opera. As a master of the varied possibilities of the voice, Bellini teased out the proficiencies for vocal production and created a novel art which culminated in the bel canto style. 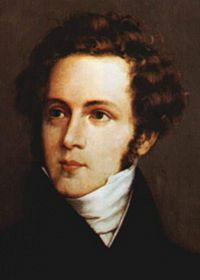 Bellini perceived a dual purpose for vocal works; first for the development of the aria and vocal piece within the opera or context of the song, and second, for the wider context of presenting that opera or musical drama as a symbol of the beauty of human accomplishment within the arts. Born in Catania, Sicily, in 1801, Bellini, unusually blond and blue-eyed, a throw-back to his antecedents in central Italy, was a child prodigy from a highly musical family, not unusual for the child of an organist and both his father and grandfather were known composers. Legend has it he could sing an air of Valentino Fioravanti at 18 months, began studying music theory at two, the piano at three, and by the age of five could, apparently, play well, although he never played as well as Rossini. His first composition is said to have dated from his sixth year. Regardless of the veracity of these claims, it is certain that Bellini's future career as a musician was never in doubt. As his learning was mostly at home and from priests he was not educated in the worldly sense and it was not until his last two years in Paris when he would meet Lizst and Berlioz amongst other composers and experienced their interest in literature, politics and philosophy. Much later Verdi would use Shakespeare etc. for inspiration but Bellini was the last of the old school of Italy. Having learned music from his grandfather whom he'd lived with, Bellini left provincial Catania in June 1819 to study at the conservatory in Naples, with a stipend from the municipal government of Catania and was rarely to return to Sicily, except as a returning hero, although his first two professional operas were set there. By 1822, he was in the class of the director Nicolò Zingarelli, studying the masters of the Neapolitan school and the orchestral works of Haydn and Mozart. Detesting the brilliant reigning composer of the moment, Rossini, this master wanted to revert back to the plainer style of the past, with the emotions of pathos, gentle and dignified, noting that a composition must "sing" if it was to touch the heart and move the audience and pushed Bellini in that direction. He was also required to compose sacred works and small instrumental works. There are four masses and some shorter religious works that are known. However, it is only for his operas that he is remembered. It was the custom at the Conservatory to introduce a promising student to the public with a dramatic work, the result was Bellini's first opera Adelson e Salvini an opera semiseria that was presented at the Conservatory's theater. Bianca e Gernando met with some success at the Teatro San Carlo, leading to an offer from the impresario Barbaia for an opera at La Scala. This was extremely unusual for a novice composer and in an atmosphere akin to Hollywood in the thirties, where novice composers were expected to write for second rate theatres and at a rate of three a year. As he was matched with the best librettist available and on the basis of his student operas he was accepted. Il pirata was a resounding immediate success and began Bellini's faithful and fruitful collaboration with the librettist and poet Felice Romani, and cemented his friendship with his favored tenor Giovanni Battista Rubini, who had sung in Bianca e Gernando. Bellini spent the next years, 1827–1833 in Milan, where all doors were open to him. Supported solely by his opera commissions, for La straniera (1828) was even more successful than Il pirata, sparking controversy in the press for its new style and its restless harmonic shifts into remote keys, he showed the taste for social life and the dandyism that Heinrich Heine emphasized in his literary portrait of Bellini (Florentinische Nächte 1837). Opening a new theater in Parma, his Zaira (1829) was a failure at the Teatro Ducale, but Venice welcomed I Capuleti e i Montecchi, which was based on the same Italian sources as Shakespeare's Romeo and Juliet. The next five years were triumphant, with major successes with his greatest works, La sonnambula, Norma and I puritani, cut short by Bellini's premature death at thirty four, in 1835. The final two–and–a–half years of his young life he spent briefly in London and then in Paris hoping to write for the Opera and to find a wife. Instead he had a huge success with the Theatre-Italien. After consultations with Rosetti (artistic guide for the company) and hearing the new symphonies, Beethoven's Pastoral a special favorite, he wrote ''I Puritani the hit championed by Queen Victoria. Bellini died in Puteaux, a quiet suburb near Paris, where he composed, of acute inflammation of the intestine, and was buried in the cemetery of Père Lachaise, Paris; his remains were removed to the cathedral of Catania in 1876. The Museo Belliniano, Catania, preserves memorabilia and scores. Never clearly defined, bel canto does not simply mean beautiful singing. It's the particular art of voice production by which distinctive timbres of the classical Italian school of singing can be achieved. With the development of bel canto, singers acquired a unique ability to develop as outstanding soloists. The unusual timbres and clear production that they acquired, together with their messa di voce and coloratura, made their operatic arias as famous outside Italy. Tuition was not based on any explicit theoretical method. It's teachers, the maestri, were themselves expert performers. They instructed their pupils the same way that they themselves had learned, by trial and error, until their pupils were able to achieve the right vocal quality. As this was because they did not make their art explicit, the maestri were suspected of using their method to protect professional secrets. The voice, is a unique instrument. Since earliest times it has been the vehicle to express human feelings—joy, sorrow, love and fear, as well as reactions to external stimuli—astonishment, horror, dislike, and hatred. This capacity of the human voice was to serve as the model in designing the various wind and string instruments that make up the modern orchestra. However, neither hand-made nor factory-made instruments have ever been able to achieve the same flexibility and instrumental performers have striven after this in vain. For Renee Flemming (modern American diva) bel canto represents the culmination of all the elements of great singing. To the sense of line and beauty of tone required in Mozart, bel canto brings extended range and fiery coloratura. It also asks the artist to plumb every emotional depth to flesh out characters that are often loosely drawn. Bel canto has real structure and demands the exercise of good taste but within these rules there is an exhilarating and creative freedom. In the ancient forest in which the opening scene of Bellini's Norma unfolds, the Druidess Norma prays to the moon, calling on that "Casta diva"—chaste goddess—to shed her light on that sacred grove. The line of Norma's melody depicts different facets of this light—the repeated high. As suggesting the moon's glowing orb, the B flat, its radiant shafts and the caressing descent of the of the chromatic scale, its soft falling light. Thus, the moon goddess kisses her anointed and those kisses must be heard in the way that the voice gleams, floats and skates, like silvery light on a mysterious night—Albert Innaurato. From the age 24 for the next ten years Bellini composed eleven operas more than half being quite remarkable. This begs the question as to how great his music could have become if he had lived on. His unique gift for melody influenced the greatest of composers, not only of opera, Chopin amongst them. Donizetti had been influenced by Rossini and Rossini also gave Bellini some of his inspiration. However, Bellini did not have the natural fluidity of composing that caused these two to dash off operas in weeks or even days to meet deadlines for he worked much slower, an opera a year was his pace. In the Bel Canto vein, his is of the purest and most sustained melodic invention of this tradition. Bellini revised and revised for perfection and those work methods were that of a romanticism that had not yet penetrated Italy as it had Germany. The natural heir to this working style was Beethoven. Bellini cylinder recordings – from the Cylinder Preservation and Digitization Project at the University of California, Santa Barbara Library. This page was last modified on 21 January 2016, at 15:13.